kt literary » Blog Archive » New York Times review of THE DOOR TO THE LOST! New York Times review of THE DOOR TO THE LOST! Congratulations to Jaleigh Johnson on the glowing, beautiful review of THE DOOR TO THE LOST in yesterday’s New York Times! 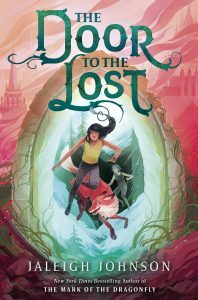 Jaleigh is a New York Times bestselling author and THE DOOR TO THE LOST is a stand alone fantasy novel for middle grade readers that released just this summer from Delacorte/ Penguin Random House. THE DOOR TO THE LOST is about friendship. It’s also about overcoming prejudice and being a refugee. Read the entire review here! ← Rebecca Roanhorse at the Tattered Cover this Saturday!